I guess you wonder why I have treated you so badly since I have been here. I really have not had time to write even a note, so busy having a good time have I been. Saturday night a college friend of mine came to spend the night at Miss Bacons with me. After dinner a Hopkins Medical student, whom I had met here before, came in and we had an evening of music. He played for us and I sang very well, for I felt that everybody there was enjoying my singing. Sunday afternoon a friend of Miss Bacons, a man high up in the Pennsylvania rail-road, came to see us in the afternoon, went to church with us, and stayed to supper and all evening - in regular Southern fashion. He has asked Mrs Bacon and me to go with him to see "Lord Dundreary" tomorrow night. Monday morning I came to Mary's where I am as happy as happy can be. Well I have followed my regular Baltimore programme and have caught - a cold. We went again to the Walters gallery yesterday. It was pouring rain. The gallery was very cold and a damp wind was blowing in a regular gale through those long rooms. I am fighting my cold desperately but I foresee that you will invite Jessie instead of me to the McClellan dinner. I shall do my best though, to get well, so that I can sing Saturday night. Saturday, as he has promised. I wanted so much to have him make the skirt that I decided to run the risk. Maybe he will try harder to be prompt because I have impressed upon him that I must go back Saturday, than he would otherwise. I shall take the ten sixteen train home on Saturday morning unless the tailor keeps me too long. If I do I shall reach Princeton at two o'clock. Won't it be strenuous going to the Theatre Friday night and to the Tailors at eight-thirty Saturday morning? 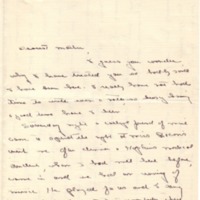 McAdoo, Eleanor Wilson, 1889-1967, “Eleanor Randolph Wilson McAdoo to Ellen Axson Wilson,” 1909 April 22, WWP19557, Eleanor Wilson McAdoo Collection at the University of California-Santa Barbara, Woodrow Wilson Presidential Library & Museum, Staunton, Virginia.